HOW WAS THE INQUISITION ORGANISED? 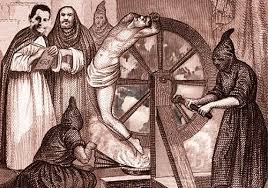 The Medieval Inquisition is used to describe the various inquisitions that started around 1184, including the Episcopal Inquisition (1184-1230’s) and later the Papal Inquisition (1230’s). The wars of independence of the former Spanish colonies in the Americas concluded with the abolition of the Inquisition in every quarter of Hispanic America between 1813 and 1825. In Portugal, in the wake of the Liberal Revolution of 1820, the "General Extraordinary and Constituent Courts of the Portuguese Nation" abolished the Portuguese inquisition in 1821. The last execution of the Inquisition was in Spain in 1826. This was the execution by garroting of the school teacher Cayetano Ripoll for purportedly teaching Deism in his school. In Spain the practices of the Inquisition were finally outlawed in 1834. In Italy, after the restoration of the Pope as the ruler of the Papal States in 1814, the activity of the Papal States Inquisition continued on until the mid-19th century, notably in the well-publicised Mortara Affair (1858–1870). In 1908 the name of the Congregation became "The Sacred Congregation of the Holy Office", which in 1965 further changed to "Congregation for the Doctrine of the Faith", as retained to the present day. Before the twelfth century, the Catholic Church gradually suppressed heresy, usually through a system of ecclesiastical tribunals. Initially, the persecution was carried out mostly by state authorities, but the Catholic Church gradually became more active as episcopal jurisdiction grew in power. The Church's punishment included excommunication, proscription, and imprisonment. Although many states allowed the Church to use the death penalty, initially it was not frequently imposed, as this form of punishment had many ecclesiastical opponents. In the twelfth century, to counter the spread of Catharism, prosecution against heresy became more frequent. Church Councils, composed of bishops and archbishops, were charged with establishing inquisitions. Later, in the thirteenth century, the pope assigned the duty of carrying out inquisitions to the Dominican Order. Inquisitors acted in the name of the Pope and with his full authority. They used inquisitorial procedures, which was a common law practice at the time. They judged heresy alone, using the local authorities to establish a tribunal and prosecute heretics. After the end of the fifteenth century, Inquisitions were headed by a Grand Inquisitor. Inquisition in this way persisted until the nineteenth century. In the sixteenth century, Pope Paul III established the Roman Inquisition. This was a system of tribunals, ruled by the "Supreme Sacred Congregation of the Universal Inquisition," staffed by cardinals and other Church officials. In 1908, its name was changed to "Supreme Sacred Congregation of the Holy Office" by Saint Pope Pius X. This, in turn, was changed in 1965, to the Congregation for the Doctrine of the Faith, which continues to be the modern name. Historians distinguish between four different manifestations of the Inquisition: The Medieval Inquisition, the Spanish Inquisition, the Portuguese Inquisition, and the Roman Inquisition. Because of its objective, combating heresy, the Inquisition had jurisdiction only over baptized members of the Church (which, however, encompassed the vast majority of the population). Non-Christians could still be tried for blasphemy by secular courts. Also, most of the witch trials were held by secular courts. The Inquisition could only operate because of the consent of the secular authorities, which recognized the Church's legal jurisdiction in those areas covered by ecclesiastical law, including the right to inflict capital punishment. To understand how the Inquisition worked and the fear it caused read Richard Zimler on the Goa Inquisition , ‘The Saintly Men of Safed’ in ‘The Source ‘ by James Michener and ‘Cathedral of the Sea’ by Ildefonso Falcones. Various inquisitions started around 1184, including the Episcopal Inquisition (1184–1230’s) and later the Papal Inquisition (1230’s). These inquisitions responded to large popular movements throughout Europe considered apostate or heretical to Christianity, in particular the Cathars in southern France and the Waldensians in both southern France and northern Italy. King Ferdinand II of Aragon and Queen Isabella I of Castile set up the Spanish Inquisition in 1478. In contrast to the previous inquisitions, it operated completely under royal authority, though staffed by secular clergy and orders, and independently of the Holy See. It operated in Spain and in all Spanish colonies and territories, which included the Canary Islands, the Spanish Netherlands, the Kingdom of Naples, and all Spanish possessions in North, Central, and South America. It targeted primarily converts from Judaism (Conversos and Marranos) and from Islam (Moriscos or secret Moors) — both groups still resided in Spain after the end of the Islamic control of Spain — who came under suspicion of either continuing to adhere to their old religion or of having fallen back into it. Somewhat later the Spanish Inquisition took an interest in Protestants of virtually any sect, notably in the Spanish Netherlands. In the Spanish possessions of the Kingdom of Sicily and the Kingdom of Naples in southern Italy, which formed part of the Spanish Crown's hereditary possessions, it also targeted Greek Orthodox Christians. The Spanish Inquisition, tied to the authority of the Spanish Crown, also examined political cases. In the Americas, King Philip II set up two tribunals (each formally titled Tribunal del Santo Oficio de la Inquisición) in 1569, one in Mexico and the other in Peru. The Mexican office administered Mexico (central and southeastern Mexico), Nueva Galicia (northern and western Mexico), the Audiencias of Guatemala (Guatemala, Chiapas, El Salvador, Honduras, Nicaragua, Costa Rica), and the Spanish East Indies. The Peruvian Inquisition, based in Lima, administered all the Spanish territories in South America and Panama. From 1610 a new Inquisition seat established in Cartagena (Colombia) administered much of the Spanish Caribbean in addition to Panama and northern South America. The Inquisition continued to function in North America until the Mexican War of Independence (1810–1821). In South America Simón Bolívar abolished the Inquisition; in Spain itself the institution survived until 1834. The period 1569–1621 also witnessed a series of controversial trials such as that of the Archbishop of Toledo and Primate of Spain, Bartolomé de Carranza (1503–1576) who spent many years in jail. Juan Antonio Llorente the General Secretary of the Inquisition in Madrid from 1789 to 1814 had access to Inquisition archives. He wrote his great work ‘The History of the Inquisition of Spain, from the Time of its Establishment to the Reign of Ferdinand VI’ which was published in Paris in 1817/18. In this he estimated that 31,912 people were executed between 1480-1808. Analysis of a Historical Data Bank," in Henningsen and Tedeschi, 116. Included in the category "All Others"
superstition (7.9%), and various (6.8%). The "Total Relaxed" involves only those sentenced to death in person. The motivations behind the Spanish Inquisition (1478-1834) have long intrigued historians. This paper explores the role of the Spanish Inquisition as a repressive tool of the Spanish Crown and provides evidence regarding the long-term eﬀects of this institution. In particular, I explore the relationship between inquisitorial activity and war from both a theoretical and an empirical point of view. The government’s demand for social control/repression was greater in periods of war because war increased the likelihood of internal revolts. To minimize the threat of rebellion, the Inquisition conducted more trials when Spanish war activity was intense. However, once the costs of the repressive activities exceeded its beneﬁts, the Inquisition decreased its level of repression. This behavior indicates an inverse-U relationship between inquisitorial and war intensity. To test the predictions of this framework, I assemble time series data for seven Spanish inquisitorial districts addressing the annual trials of the Inquisition and wars conducted by the Spanish Crown. I show that there is an inverse-U relationship between wars and inquisitorial activity. My results are robust to the inclusion of data on the severity of the weather (droughts) and to adjustments for spillover eﬀects from districts other than the main district under analysis. Using a database of 35,000 trials of the Inquisition, I show that religious persecution was especially signiﬁcant during early stages of the Inquisition, while repressive motivations better explain the behavior of this institution in later periods. With respect to the consequences of the Spanish Inquisition, I show that regions that were more aﬀected by the Inquisition are associated with lower economic development. The Portuguese Inquisition formally started in Portugal in 1536 at the request of the King of Portugal, João III. Manuel I had asked Pope Leo X for the installation of the Inquisition in 1515, but only after his death (1521) did Pope Paul III agree. The Portuguese Inquisition targeted the Sephardic Jews, who had been forced to convert to Christianity. Most were those expelled by Spain in 1492 and ha moved to Portugal. The Portuguese Inquisition came under the authority of the King. At its head stood a Grand Inquisitor, or General Inquisitor, named by the Pope but selected by the Crown, and always from within the royal family. The Grand Inquisitor would later nominate other inquisitors. Cardinal Henry was the first Grand Inquisitor. Later he became King Henry of Portugal. Courts of the Inquisition operated in Lisbon, Porto, Coimbra, and Évora. The Portuguese Inquisition held its first auto-da-fé (the Portuguese equivalent of the Spanish auto de fé) in Portugal in 1540. It concentrated its efforts on rooting out converts from other faiths (overwhelmingly Judaism) who did not adhere to the observances of Catholic orthodoxy; the Portuguese inquisitors mostly targeted the Jewish "New Christians", conversos, or marranos. The Portuguese Inquisition expanded its scope of operations to Portugal's colonial possessions, including Brazil, Cape Verde, and Goa, where it continued as a religious court, investigating and trying cases of breaches of the tenets of orthodox Roman Catholicism until 1821. King João III (reigned 1521–1557) extended the activity of the courts to cover book-censorship, divination, witchcraft and bigamy Originally oriented for a religious action, the Inquisition had an influence in almost every aspect of Portuguese society: politically, culturally and socially. According to Henry Charles Lea between 1540 and 1794 tribunals in Lisbon, Porto, Coimbra and Évora resulted in the burning of 1,175 persons, the burning of another 633 in effigy, and the penancing of 29,590. But documentation of fifteen out of 689 Autos-da-fé has disappeared, so these numbers may slightly understate the activity. The "General Extraordinary and Constituent Courts of the Portuguese Nation" abolished the Portuguese inquisition in 1821. The Portuguese started this Inquisition in their colony of Goa in 1560. Where it was primarily devoted to antisemitism and anti-Hinduism, Aleixo Dias Falcão and Francisco Marques set it up in the palace of the Sabaio Adil Khan. In 1542 Pope Paul III established the Congregation of the Holy Office of the Inquisition as a permanent congregation staffed with cardinals and other officials. It had the tasks of maintaining and defending the integrity of the faith and of examining and proscribing errors and false doctrines; it thus became the supervisory body of local Inquisitions. Arguably the most famous case tried by the Roman Inquisition involved Galileo Galilei in 1633. The penances and sentences for those who confessed or were found guilty were pronounced together in a public ceremony at the end of all the processes. This was the sermo generalis or auto-da-fé. Penances might consist of a pilgrimage, a public scourging, a fine, or the wearing of a cross. The wearing of two tongues of red or other brightly colored cloth, sewn onto an outer garment in an x pattern, marked those who were under investigation. The penalties in serious cases were confiscation of property or imprisonment. The most severe penalty the inquisitors could themselves impose was life imprisonment. Thus, when the inquisitors handed a guilty person over to civil authorities, it was tantamount to a demand for that person's execution. Following the French invasion of 1798, the new authorities sent 3,000 chests containing over 100,000 Inquisition documents to France from Rome (some were lost en route to France, others were used as scrap paper). After the restoration of the Pope as the ruler of the Papal States after 1814, Roman Inquisition activity continued until the mid-19th century. The king has every right to send his men to the Indies to demand their territory from these idolaters because he had received it from the Pope. If the Indians refuse, he may quite legally fight them, kill them and enslave them, just as Joshua enslaved the inhabitants of the country of Canaan. According to Liebman, as early as 1508, bishops in Havana and Puerto Rico informed Madrid that the New World was being filled with hebreo cristianos (Hebrew Christians), nuevo cristianos (New Christians), conversos (converts), Moriscos (Moors), and other heretics, in spite of several decrees barring their entry. Silvio Zavala wrote: "The Holy Office in Spanish America persecuted the apostates, Moriscos, Jews, Protestants and, in general, heretics. It manifested in America the same intransigency that had characterized the religious life of the Peninsula since the beginning of the modern period." Due to the shortage of secular clergy in the New World, the pope issued the Bull Omnimoda in 1522, and granted special permission to the prelates of the monastic orders in the New World to perform, in the absence of bishops in the vicinity, all Episcopal functions except ordination. Torquemada's organizational and administrative abilities, and his zeal for the preservation of the faith set the course of the Spanish Inquisition for the 341 years of its existence. As the activities of the Holy Office expanded, it became necessary to establish branches throughout Spain and the New World with the Suprema as the head office. The need of a tribunal of the Holy Office in Mexico was expressed as early as 1532. In fact, the first auto de fé in Mexico was held in October 1528, with Fray Vicente de Santa Maria presiding. Two Jews were burned at the stake, and two others were reconciled. On January 25, 1569, Philip II decreed the establishment of the first two formal Dominican tribunals in the New World, one for New Spain (Mexico) and one for Peru. They were known by the full title of "El Tribunal del Santo Oficio de la Inquisición". The Mexican branch included all of the audiencias of Mexico, Guatemala, New Galicia, and the Philippines. The tribunal at Cartagena was not established until 1610. Prior to that all prisoners south of New Spain were sent to Lima, Peru, for trial. The Cartagena tribunal had jurisdiction over a vast area, including the bishopries of Cartagena, Panama, Santa Marta, Puerto Rico, Popayan, Venezuela, and Santiago de Cuba. There were many Jews in Cartagena and its vicinity, and they were quite visible; but according to Seymour B. Liebman, the Holy Office was more involved in disputes among the inquisitors than in persecuting heretics and Jews. The sixty-three procesos of Jews before the tribunal in Cartagena indicate that all were born in Portugal; nine of them were tortured and only one was sentenced to serve in the galleys sailing between Puerto Bello and Spain. Even though the Holy Office was established in Portugal in 1536, there never was a tribunal in Portuguese Brazil. Brazilian prisoners were tried in Portugal. Each viceroyalty was expected to give the tribunals of the Holy Office complete cooperation. The tribunals were autonomous institutions independent of secular authority. The Holy Office was free of the control of the King.